Boredom. Well that word is pretty much synonymous with long school breaks. And I'm no exception. So I decided to follow my mum to her workplace. Not that it'll be a lot of fun but I need a breathe of fresh air and besides the internet connection here is sooo much faster than the one at home. 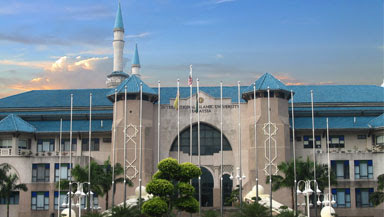 Personally, there's not much to do here but I always loved the learning environment that IIUM has. It's a picture of beauty, serenity and knowledge. You see students everywhere carrying their backpacks and books, getting ready for classes. I could see myself in the few years to come being in that kind of environment. Well, perhaps not particularly in this university but definitely in a higher learning institution. I'm at a junction where I still don't know where to go after this. It's too early to tell anyway. Just going with the flow. For now.